Saffron Walden Symphony Orchestra (SWSO) is a community orchestra formed of both professional and amateur players based in and around Saffron Walden in the district of Uttlesford. The Saffron Walden Orchestral Society also oversees the Saffron Walden Children's Orchestra (SWCO). 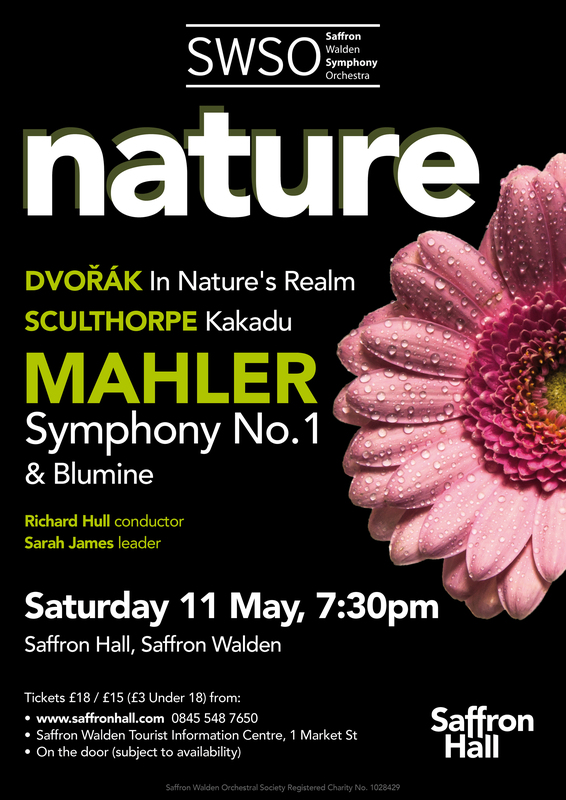 ..will be on Saturday 11 May 2019 at 7:30pm at Saffron Hall, and is entitled simply Nature. The audience will be taken on a journey through fields of flowers, crocodile-infested waters and finally to a great celebration of the natural world. The concert starts with Dvořák’s In Nature’s Realm. This resembles a landscape painting, in its richness of colour, and the unfolding of forest and lake views. Mahler’s Blumine follows. Blumine translates to “floral” or “flower”. This piece was part of Symphony No 1, but was omitted from the score by Mahler after it received harsh criticism. It was rediscovered in 1966 and has been described as a sensitive, impassioned and sentimental piece. The orchestra will then perform Australian composer Peter Sculthorpe’s Kakadu. Sculthorpe used his knowledge of the Kakadu National Park to compose this piece which evokes the sounds and feelings of the Australian bushland and outback. The final piece is Mahler’s Symphony No. 1, which was written as a celebration of the natural world. If you are interested in joining the orchestra, please do get in touch - we are always happy to hear from new players. Many of our members travel some distance to play with us; however we are of course particularly keen to hear from musicians living near Saffron Walden or in the district of Uttlesford.